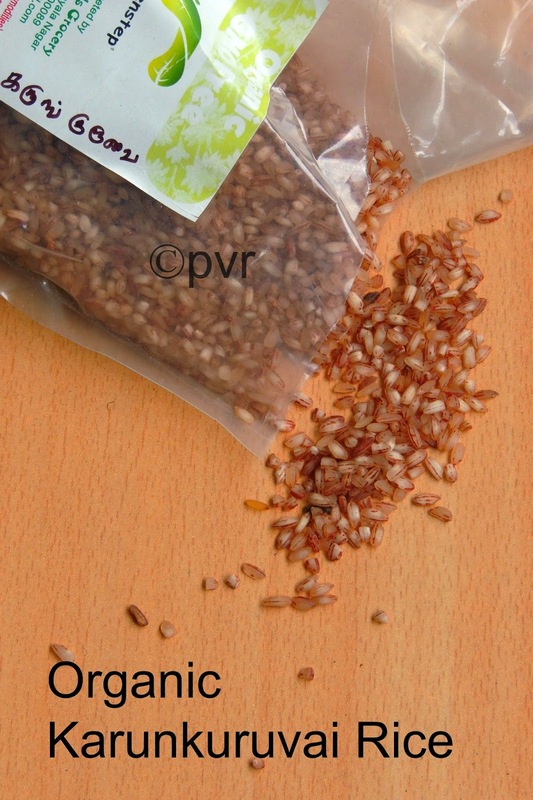 Karunkuruvai, is an another variety of rice i got through Kalpana of Life with Spices, she pampered me with a huge bag of Organic stuffs when i met her during my stay in India. We had loads of fun together and you might have already noticed i prepared some spongy idlies with an another unknown (personally for me) rice called Kattuyanam rice, check my post of idlies i prepared using Kattuyanam rice to get a better idea about this traditional rice cultivated in Southern part of India especially in Tamilnadu.Today's post is going to be a breakfast or dinner dish aka dosas i prepared few days back with Karunkuruvai rice, this rice looks bit dark when compared to other rices and tastewise nothing different from the usual one, but healthwise they have many interesting facts, actually i loved making this dosas out of this wonderful organic rice. This rice is one among the forgotten rice, but this rice belongs to an another variety of rice called Kuruvai, actually this karunkuruvai is an important sub species of kuruvai rice. This rice is consumed to treat Elephantiasis and arthritis, also this rice is given to patients suffering from Chickenpox. This rice is very much good to make both idlies and dosas. But i want to experiment the taste of this rice by cooking them in various method, let me post all my experiments with this rice soon.Check your nearby organic stores to get many interesting forgotten traditional rices and try to include them atleast once a while. Wash and soak the rices together and soak the urad dal with fenugreek seeds, keep aside everything for 3-4hours. Grind the urad dal as fine fluffy batter, remove it from the grinder. Add the soaked rice, cooked rice and grind as bit coarse batter. Mix the urad dal batter and rice batter together in a large bowl with enough salt. Keep it for fermentation for overnite. Next day while making dosas, check the consititency of the batter. If its thick, add some water and make it as a dosa batter. Heat a non stick pan or a griddle, grease it with few drops of oil with a paper towel. Pour a ladle of this batter, spread the batter in clockwise direction to form a round bit thin dosas. Close it with a lid, put the flame in simmer. When the dosas are partially cooked, sprinkle enough idly podi on the top, drizzle some oil , close again with the lid and cook until the dosa gets well cooked. Remove it and have with your favourite chutney. 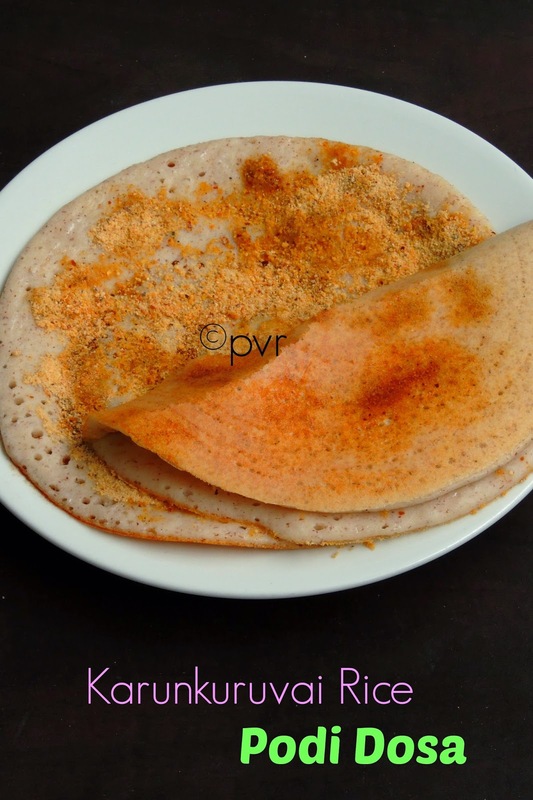 dosa looks yummy..I have this rice in my pantry.. will give this a try.. Such a healthy dosa, looks great! Dosa looks yummy nd crispy... nice recipe dear.. I have never come across this rice before but it looks healthy and interesting. Never heard abt this rice,healthy dosa..thxs for sharing it!! 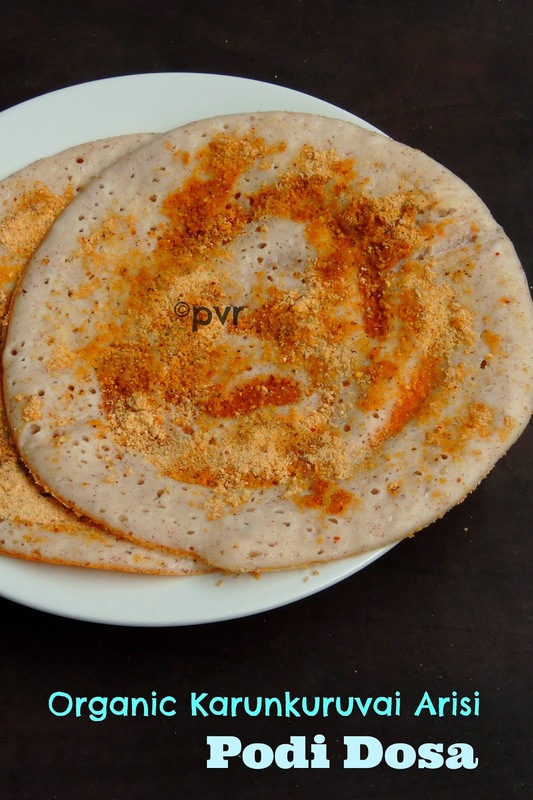 healthy n tasty podi dosa! !